College Park, originally called Forest Avenue, was a mission of First Baptist Church and is at Walker Avenue and Aycock Street. 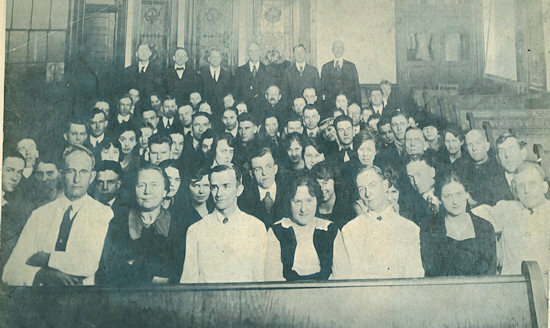 The church’s organizational meeting on March 11, 1906, took place in the old Administration Building on the college campus that was at the State Normal School for Women, now UNCG. 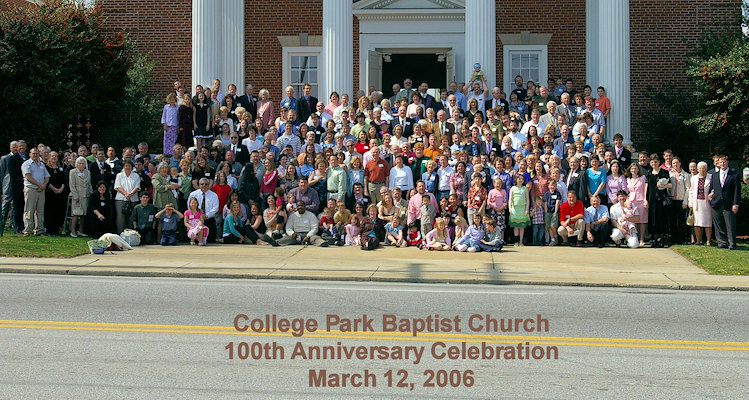 In 2006, we celebrated our 100th birthday (see photo above). Because of its proximity to the campus, college students were a huge part of this church from the very beginning. 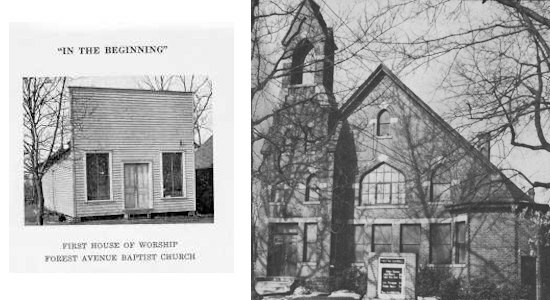 The college students gave the first money toward the building of the new church on Forest Avenue (pic below, on right). By 1923, there were so many students in Sunday school that the church built a hut on the church grounds for them to meet in. Every year some kind of social was planned for the Baptist students on campus, a tradition that continues. No matter what our college ministry has been called or how it has evolved through the years, College Park has been here to provide a spiritual place away from home, a home-cooked meal or a care package at exam time. Our own Phyllis Kelly is a product of this ministry. She was “adopted” by a family of the church, the Kellys. They became her college parents. During her student years, she joined the family on trips to the beach and to hockey games, enjoyed the celebration of birthdays, and was included in extended family dinners. Phyllis became such a member of the family that six months after she graduated from school, she became their daughter-in-law, marrying the Kellys’ son Buddy. Both Phyllis and Buddy are pillars of the church today. The Educational Building at the present location was built in 1940 because the church building on Forest Avenue became too small. Forest Avenue became College Park at that time. The sanctuary was built and dedicated in 1952. College Park enjoys a rich history. It has had 12 senior pastors and was the first church in Greensboro to have an ordained woman minister in its pulpit. The church has assisted at least four other churches in Greensboro in getting established — Florida Street Baptist, Guilford Baptist, Clifton Road Baptist and Immanuel Baptist. We have ordained at least 12 of our members as ministers and sent nine as missionaries to foreign countries.